If you want to create your own social button and want to retrieve the number of shares via WordPress you can use the wpbfsb_get_remote_functions filter hook. You can find the filter in the classes/model/remote.php file (see get_remote_functions() function). * Adds a new function to the drop-down list on the edit screen. * Returns the number of shares, likes, etc. * @return int The number of shares, likes, etc. Save your file maybe like my-fixed-social-share-remote-function-for-x.php and upload it to the wp-contents/plugins/ folder. Then activate it from the plugin list. 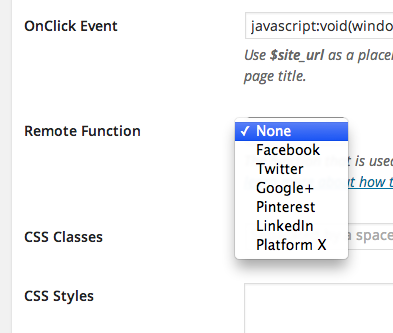 After this, add a new button and choose your just created function from the dropdown list like this.